@Wuzzy now that animations repeating themselves have been fixed can you re-add death-animations? This is actually ahead of Minecraft pocket edition in that the music disks actually work. I have yet to hear Minecraft music. Thing is I can't play this subgame on my tablet. What is the best way to lighten it up? Hey Wuzzy. I know I submitted a patch to you over github, but I have another patch for pumpkins and redstone and a patch for strange behavior with pistons and pumpkins. What is the best way to get you a patch? Should I open a bug report for it and put the patch there or is some other way better? Patches are welcome. You can post them in the bug tracker, that way I won't forget them. Also please write what each patch does. But using other means to send me patches is fine, too. Just make sure the patches don't get lost or forgotten over time. If you commit stuff in your own repository, a link to that repository is helpful, too. As long the commits are mergable, of course. This is preferred for large changes. Otherwise, the preferred method are patches. Bananas! I'm losing loyalty to minetest! Somebody help me out here. Pardon me if this has already been asked before, but how do you install modpacks like minetest2? 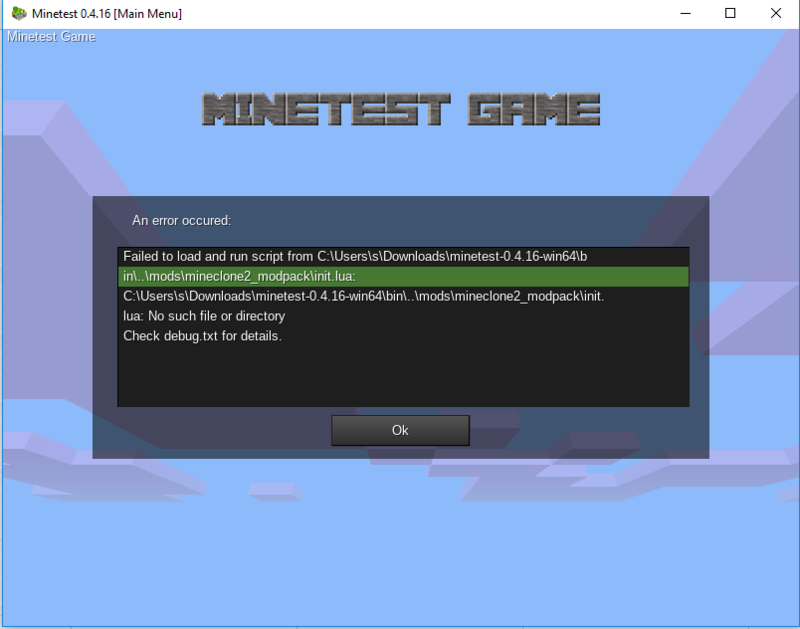 I have no problems installing mods like fire, but my experience installing minetest2 has befuddled me. I am using minetest version 0.4.16 and downloaded minetest2 version 0.36.2 from http://repo.or.cz/MineClone/MineClone2. ... 030fb2.zip. After that I moved the folder downloaded, MineClone2-bcc87de, from my Download folder C:\Users\s\Downloads to C:\Users\s\Downloads\minetest-0.4.16-win64\mods\ and renamed it "minetest2". It showed up in my list of mods when I pressed "Configure"
I understand that minetest2 is a modpack and not a mod, and so init.lua files will only be found in its subdirectories that are mods themselves (eg. C:\Users\s\Downloads\minetest-0.4.16-win64\mods\mineclone2\mods\CORE\flowlib\). But https://wiki.minetest.net/Installing_Mods seems to suggest that modpacks can be installed just like mods, and furthermore they don't even need to be renamed. "A modpack is installed in the same way as a mod, but you are usually not required to change the directory name of the modpack. Just make sure the name does not collide with that of any other installed mod or modpack." anonymousQsx: this is a game, not a modpacks. To install a game you place it in the games folder similar to how you place a mod in the mods folder. 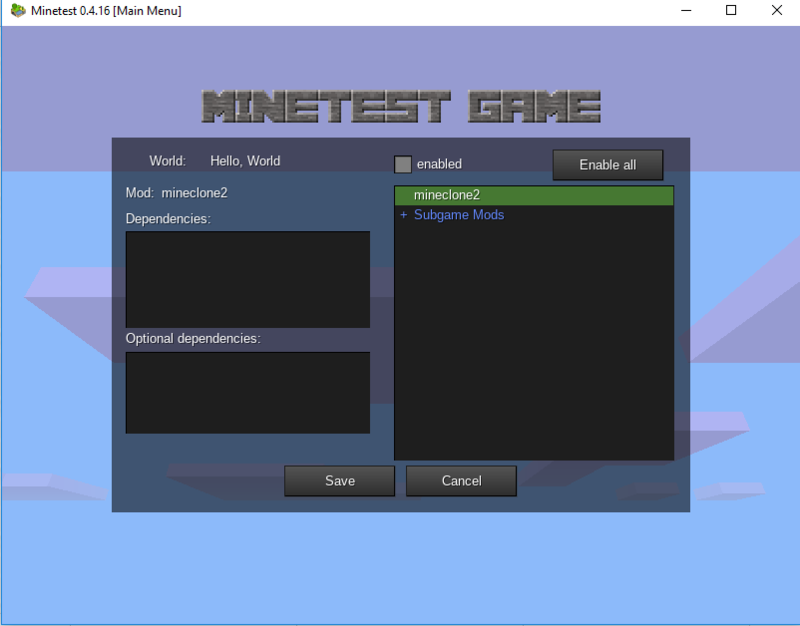 Minetest is a game engine which runs games. Yes. MineClone 2 is a game. A sandbox game, to be precise. It is NOT a mod, NOT a modpack and NOT a texture pack. Wuzzy wrote: Yes. MineClone 2 is a game. A sandbox game, to be precise. It is NOT a mod, NOT a modpack and NOT a texture pack. I thought minetest.exe was the sandbox game and mineclone 2 was a subgame. mineclone 2 is a game - subgame is the old name for it. Drat. Literally JUST finished getting the concept of sub games and the difference between mineclone2 and regular minetest and Minecraft into my siblings heads. So I've been playing this game quite a bit and I like it a lot. It's as close to Minecraft as anything I've seen so far. I would like to know if there's any villages / village mods that still work. Does the mod mentioned early in this thread mineclone 2 still work? if not is it possible to add minetest mods meant for other games to the mod folder of mineclone 2 to add functionality? Mg_villages maybe? I know that that is not really in the spirit of cloning minecraft but I find that that is the one thing I'm sorely missing in this game is that feeling that the world is populated even in a shallow minecraft-y way. Why hasn't this worked on my tablet? zargulthewizard wrote: Why hasn't this worked on my tablet? Might be too heavy. How exactly does it 'not work'? Is there any actual document out there which list the block-elements. i want it for the mapper-renderer-tool. The game flat out crashes, and I am returned to my home screen without any error message of any kind. I know it's heavy, but is it code or images? Okey dorey. Will get debug.text file. As for other games, I haven't tried any, but I know my phone acted the same way when I ted to run the tecnic mod on it (which e tablet can handle), so I am sure it is some sort of overload. Thanks for your work in this enjoyable game. I have just a little issue with the bow dealing no damage. I'm using MineClone2 v0.36.2 with Minetest 0.4.16. It seems that when dist = 0, the arrow object is taken for damage instead of the mob object initially found.